Yana created this fabulous contemporary style holiday card. She used our Holiday Sentiments die by first embossing the words “Happy Holidays” into the white cardstock strip. Then she cut/embossed the words with black cardstock and adhered them into the embossed area to create an inlaid sentiment. 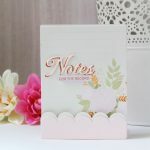 Yana used our Card Creator A-2 Matting Basics A die to create an embossed frame on to the card front. Both such a subtle but wonderful effect. 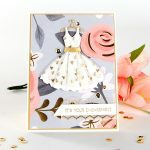 Card measures 4¼ x 5½”. 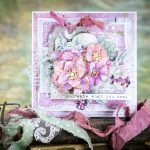 View the video tutorial below to recreate the card.